Russian honey cake called Medovik has been a tradition for centuries. 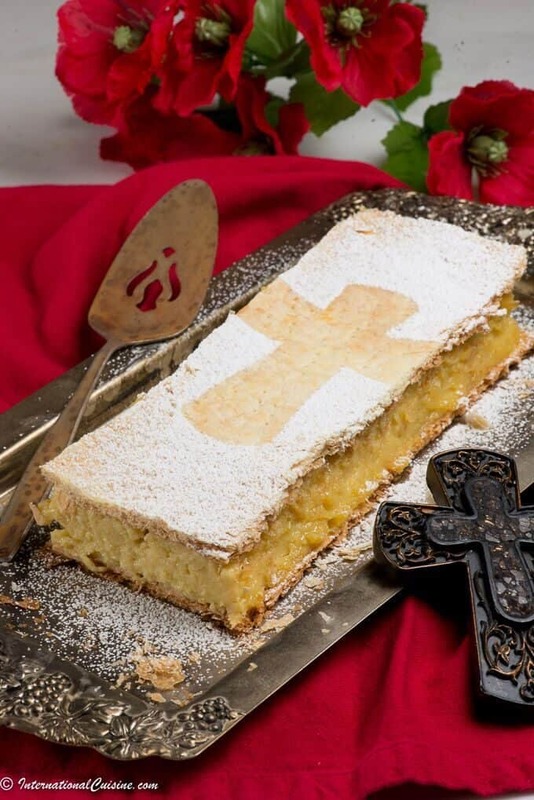 It is a layered cake with honey cookie like segments called korzh, that soften in between cream. It is best served after refrigeration when the layers actually absorb the cream and soften. 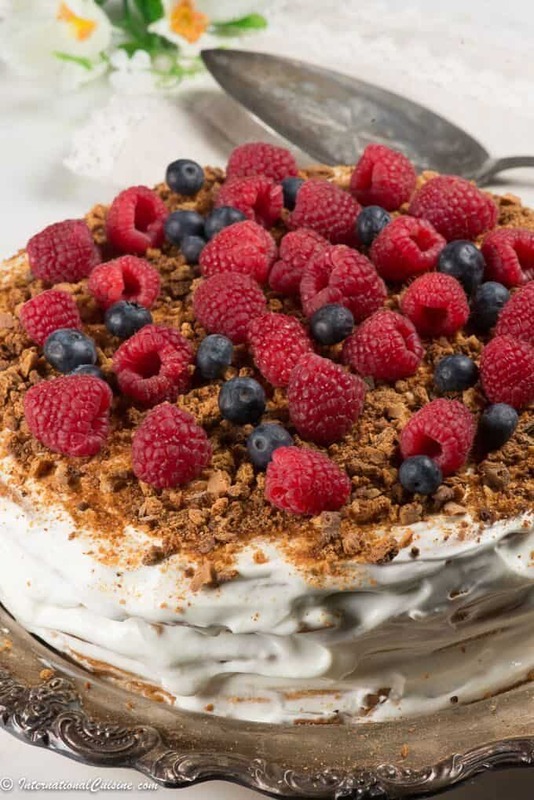 It is often topped with berries but sometimes served plain with just cream. I am often intimidated by a layered cake but this one was pretty easy to make and well worth the effort. It works well to use a spring form pan which you can use to cut out the proper size layers. This particular Russian honey cake called Medovik has a story. In the Imperial Palace in the 19th century Empress Elizabeth (wife of Emperor Alexander I) hated honey. A new confectioner was hired and did not realize this of the Empress and presented this delightful cake. She did not realize it had honey in it and fell in love. Today there are numerous variations of this Russian honey cake called Medovik. Some are made sweetened condensed milk, butter cream and custards. 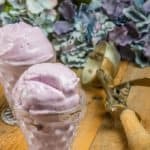 This recipe is the original made with cream and is scrumptious. Did you know that Lake Baikal in Russia holds 20 percent of the worlds fresh water? If you would like to learn more about Russia be sure to check out “Our Journey to Russia“. Get great authentic recipes and be sure to join the journey when you stop by, it’s free! A scrumptious layered honey cake with a history! Add 3/4 cup sugar, 1/4 cup honey and 2 Tablespoons unsalted butter to a medium sauce pan and melt them together over medium/low heat, whisking occasionally until sugar is melted. You need to watch closely and make sure the heat is not too hot or you will scorch the mixture. Whisk in the baking soda until no lumps remain, then fold in your 3 cups flour 1/2 cup at a time with a spatula until the dough is no longer sticky and firm. You may need more or less flour which is why you are adding ½ cup at a time. You want to end up with a clay like consistency. Cut the dough into 8 equal pieces and move on to the next step quickly as the layers roll out much easier while warm. 6.. On a well-floured surface, roll each piece out into a thin 9″ circle, about 1/8″ thick. Use extra flour on your rolling pin to keep the dough from sticking. If your dough turns cool, stick in the microwave for a few seconds and resume. Place a 9″ plate or base from a springform mold over your rolled dough and trace around it with a pizza cutter to get a perfect circle. Keep the scraps for later. Finally bake the scraps. Once the scraps are baked, cooled and firm, put them in a Ziploc bag and you can crush them with your rolling pin. These are your honey cake crumbs. Beat 1 cup heavy cream until stiff peaks form. In a separate bowl, whisk together 32 oz. sour cream with 2 cups powdered sugar. Fold the whipped cream into the sour cream. Refrigerate until ready to use. Spread about 1/3 cup cream on each cake layer. Press the cake layers down gently as you go to keep the layers from having air bubbles. Frost the top and sides with the remaining frosting. ( make sure to put plenty in between the layers as this helps soften the korzh). Dust the top and sides with your honey cake crumbs, then cover with plastic wrap and refrigerate overnight. This allows the cream to soften the honey cake or korzh. Add the berries on top if using and serve. Romanian Papanaşi is a famous treat there. Honestly it makes me want to hop on the next plane just for this. 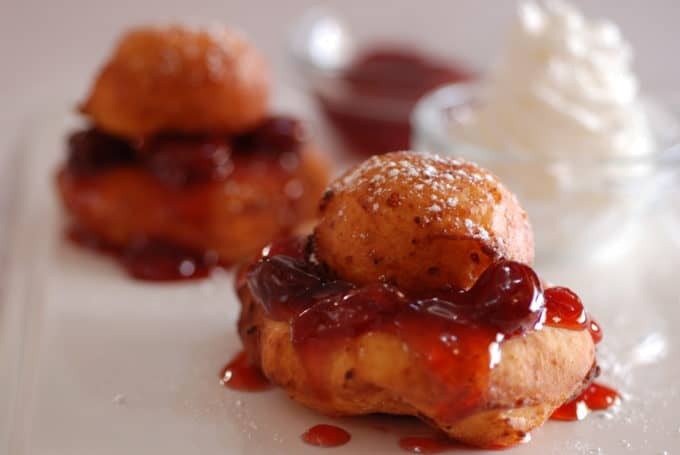 Romanian Papanaşi is a fried cheese doughnut the hole of the doughnut is placed on top and in between it is smothered with cherry preserves and topped with confectioners sugar. A heavenly bite indeed. Oh and did I mention whipped cream too….. I typically use a deep fryer for these types of recipes, this is the one I use and I love it! It makes frying so easy although you can easily just use a deep skillet as well. Whichever you have is what you should use, you will want to make these again and again. Did you know that Francesco Illy, the founder of Illycaffe was born in Romania in 1892. He also invented the first automatic steam espresso coffee machine. This Romanian Papanaşi would be superb with an espresso! If you would like to learn more about this interesting country of Romania be sure to check out “Our Journey to Romania“. You will also find more authentic and delicious Romanian recipes. Have you ever traveled to a destination just for the food? If you have, I would love to hear about it in the comments below. Honestly this recipe truly makes me want to hop on a plane! There is not only wonderful food to try in Romania, it is home to some amazing UNESCO sites as well. A Romanian treasure! I think it is worth a plane trip just to eat more of these, they are awesome! Fruit preserve strawberry, raspberry, sour cherry etc. In a large bowl mix the cottage cheese, sugar and baking powder. Add the eggs, vanilla, salt and lemon zest. Mix very well to get a smooth as possible. Slowly add in the flour a little at a time. If the dough is too moist add more flour, you don’t want the dough to be too sticky. Make small balls of dough, to fit in the palm of your hand, make into a donut shape with a hole in the middle. Dip into a small bowl of flour. Fry them in oil until golden brown on both sides. Remove onto a paper towel to remove any excess oil. 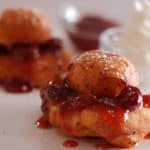 Assemble the donut with some sour cherry preserve on top add the small ball on top of that, sprinkle with some powdered sugar and a dollop of whipped cream or sour cream on top. Cuban churros are basically a fried dough rolled in sugar. 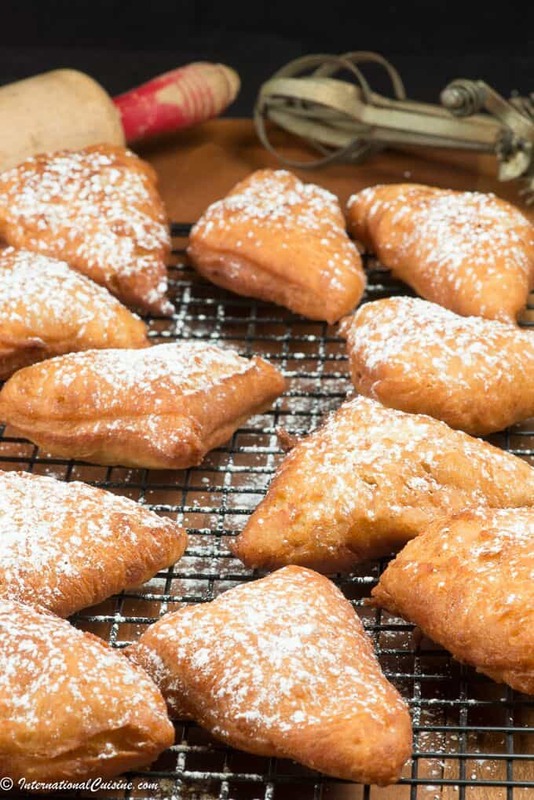 Who doesn’t love fried dough? Serve it along side some hot chocolate for dipping and you have a match made in heaven! The churros are best served hot after frying. They are actually too easy to make, if you know what I mean! Sift the flour in a mixing bowl, while bringing the salted water to a boil. Pour the boiling water over the flour, stirring lightly until the dough forms into a ball - about 30 seconds. The dough should be compact, but not runny or too soft. If you have a churrera or a cookie press, load it up with the dough. If not, a big freezer zip lock or a pastry bag with a corner cut off works, too. Use a star shaped tip, if you have it. Squeeze dough onto waxed paper in about 6 inch strips. Fry the dough in the super-hot oil, turning once when you see the edges barely begin to pick up color. (think pancakes) Fry for about 5 minutes total. Remove with a slotted spoon, draining as much oil as possible and place on the sugar plate and roll in the sugar. 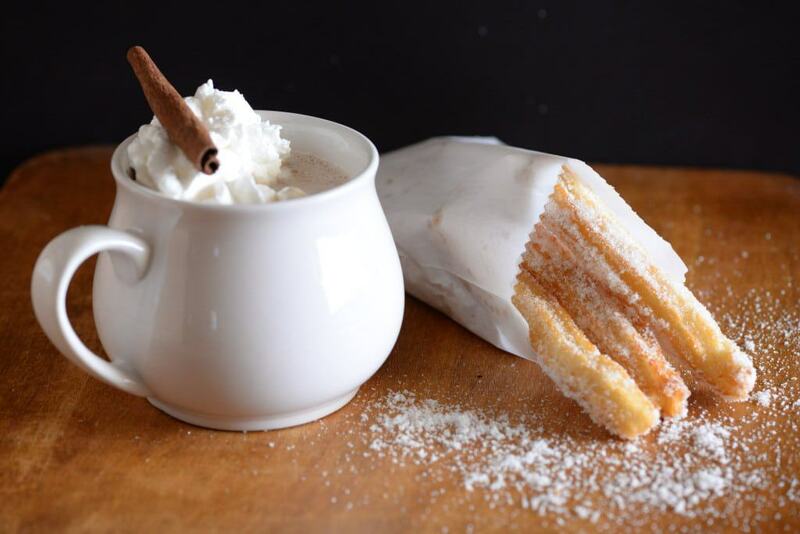 Serve immediately with some hot chocolate with whipped cream and cinnamon stick YUM! 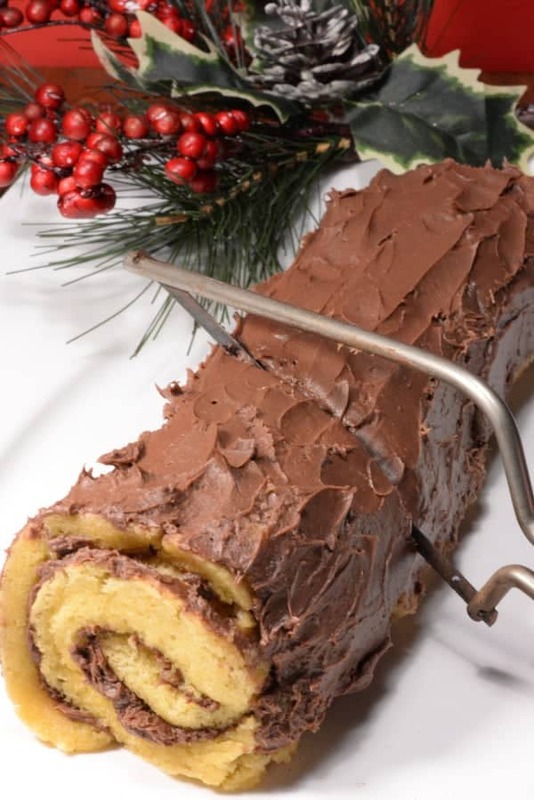 Yule log cake is a tradition that goes way back to the late 1800’s. In France during the days of Napoleon, he banned burning fires in fireplaces because he was concerned that it could spread disease. In order to keep the tradition of the yule log alive, a clever baker came up with a cake in the shape of a log. It is called Buche de Noel. They can be found everywhere during the holidays and it is a decadent treat. I am not going to say this is easy to make. I tried three different recipes and this one finally worked out. Rich butter cream frosting on light fluffy vanilla cake. This year in 2018 the winter solstice happens in the northern hemisphere on December 21st at 5:23 pm EST. It is the perfect time to take a moment, to be thankful for your blessings and set your intentions and dreams for the new season. Why not make this delicious yule log cake and enjoy it along with some wassail for an authentic Winter solstice experience. I love to write down my dreams and stuff them in a pine cone and burn it on the longest night of the year. It is also a wonderful time to simply let go of the things that are holding you back. I am wishing for you that you all your hopes and dreams come true and that you truly take a moment to breath and recognize the change of the season. No matter what your religion or beliefs, it is something we all share in together as humans. How do you plan to celebrate the solstice? I would love it if you let me know in the comments below. Beat the eggs for 5 minutes, until they turn thick and foamy. Add the sugar a little at a time, vanilla extract, and salt to the eggs and continue beating for 2 minutes. Fold the flour, a few tablespoons at a time, into the whipped egg mixture. Once the flour is incorporated into the batter, stop mixing. Gently spread the batter into the prepared pan. Bake the cake for 10-14 minutes, until the cake is just set. Invert the baked cake onto a clean, dry kitchen towel and peel off the parchment paper. Wait 3 minutes and then gently roll the cake, still in the towel, starting at the 10-inch end. Allow it to cool completely. In a small saucepan, bring the sugar and ⅔ cup water to a boil. Allow it boil until it has reduced into a slightly thickened syrup. Begin beating the egg whites on high speed again, and pour the hot sugar syrup into the eggs in a slow, steady stream. Pour the melted chocolate, espresso powder, and vanilla extract into the egg whites and continue beating them until the meringue has cooled completely, about 5 minutes. Add the softened butter to the meringue, 2 tablespoons at a time, while beating on high speed, until all of the butter is incorporated into the frosting. If it becomes runny you can chill it for a bit and then proceed. Unroll the cake and set aside the towel. Evenly spread 2 cups (or desired amount) of the chocolate buttercream on the inside of the cake and following its natural curve, gently form it into a cake roll. If you are adventurous you can cut off the ends of the cake roll on the diagonal and reattach them in the center of the cake with a bit of buttercream to fashion a “branch” coming off the main Yule log. Spread the exterior of the buche de noel with enough chocolate buttercream to cover it and gently pull a butter knife or small, offset spatula through the frosting to give the appearance of rough tree bark. 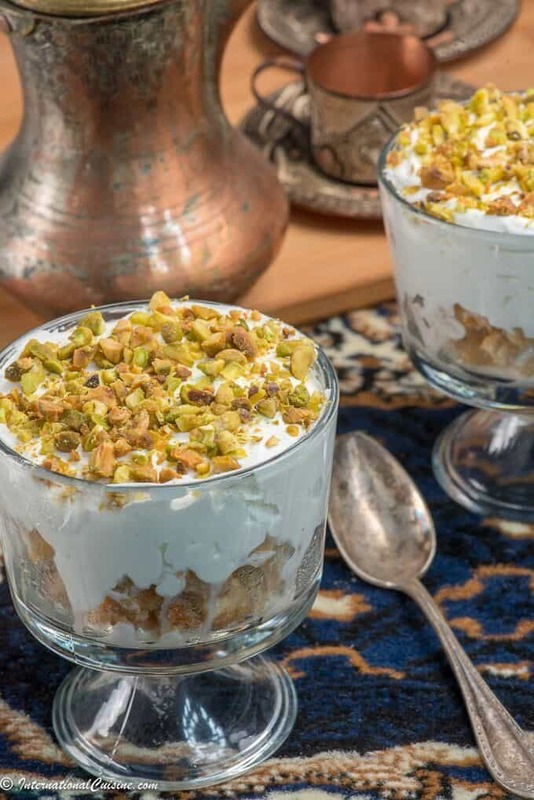 Esh Asaraya is a popular dessert in Qatar and the whole region. 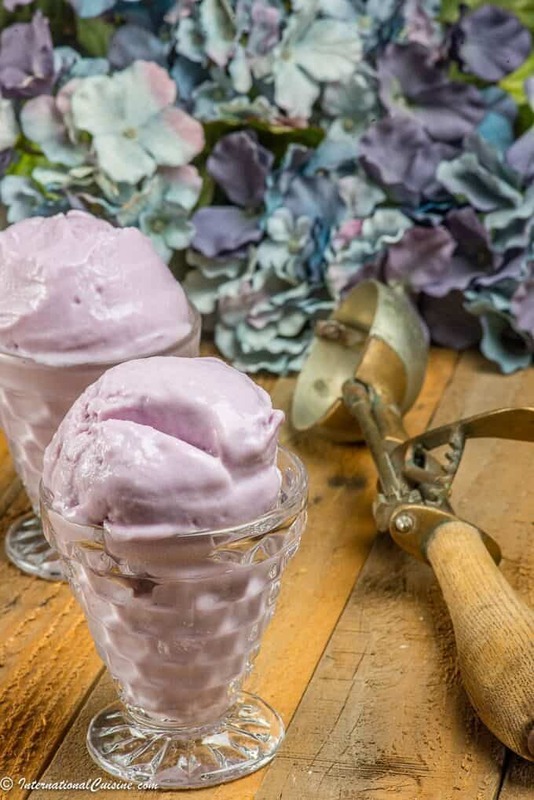 It is a sweet, creamy and delicious dessert. 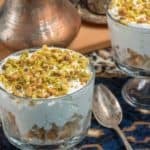 Esh asaraya is made with sweet pieces of bread that is then smothered in cream, and then is topped with pistachio nuts which adds a nice crunch to each luscious bite. What I love most about this esh asaraya recipe aside from the way it tastes is how quick and easy it is to make. You can also make it ahead of time which is a real plus when making your Qatari meal. Why not serve your Esh Asaraya alongside karak tea which is a staple in Qatar. Did you know that Qatar is one of the richest countries in all of the world. It is loaded with oil and gas and with its small population of only around 2.5 million people it has a massive GDP. If you would like to learn more about this little wealthy nation be sure to check out “Our Journey to Qatar” to learn more. There you can also find more authentic Qatari recipes that you are sure to love. Dates are also extremely popular in Qatar. They don’t grow much there in the desert region, but dates grow beautifully and is one of their exports. Another dessert that is popular in Qatar is simply sweetened buttered dates called Al Rangina. To make them all you do is use about 1/4 stick of butter and make a little rue with about 4 tablespoons of flour. Let the butter simmer for a bit and stir. Add in a cinnamon stick and mix it with the butter for a few minutes and simply arrange your dates on a plate and pour over the butter sauce. Sprinkle the dates with some powdered sugar and just like tha,t you can add a second dessert alongside the Esh asaraya to your Qatari dessert table. 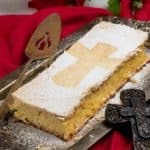 A lusciously sweet bread and cream dessert you are sure to enjoy! Trim the crust from the sides of the bread and then cut into bite size pieces and place them on a cookie tray. Heat the oven at 350 F and roast the bread till light brown color. This should just take a few minutes. Whip the heavy cream with sugar , till it attains soft peeks. Set it aside. In a sauce pan add the sugar and water. Boil until the sugar dissolves and syrup becomes sticky. Add rose water or essence to the syrup. Add the roasted bread in the boiling sugar syrup and mix well. Cook them till the sugar starts caramelize and the bread becomes a little golden in color. Now in a bowl transfer the bread mixed in syrup and press them to form a layer. You can do this in one bowl or make individual servings which ever you prefer. Next spread the whipped cream and spread it evenly on the bread crumbs. Pais de nata are ubiquitous in Portugal. You will find them in every pasteleria which are abundant on the streets of Portugal. These cute little delicious bites are not at all easy to make but well worth the effort. 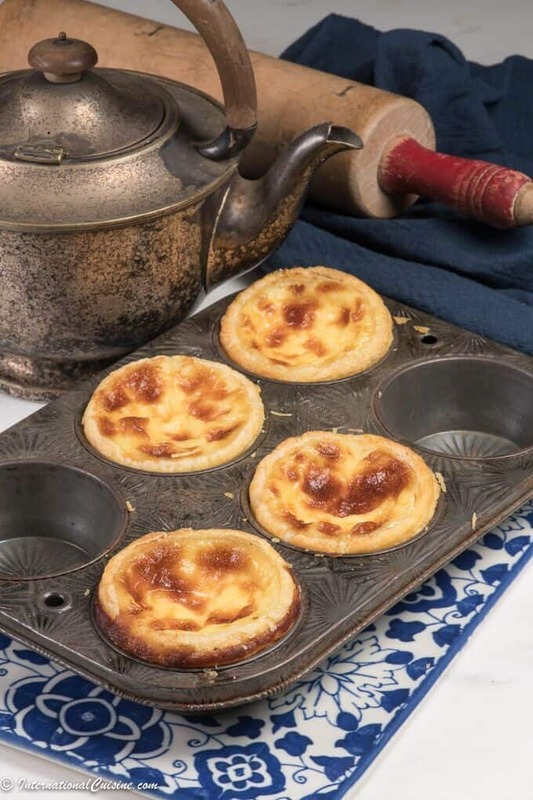 You need to have a oven that can get up to 550 degrees F.
These pais de nata were invented by nuns as they used egg whites as starch for their habits as well as preserving wine. Therefore they came up with ingenious recipes to use the yolks, so lots of of their pastries include a custard. These actually ended up being very close to the Pais de nata that you will find where they originated at the Antiga Confeitaria de Belem where they make some 22,000 per day! There oven is a whopping 800 degrees, each worker has a task and has mastered it whether it be the dough, the filling and of course guarding the top secret recipe. You should definitely use a thermometer when making the custard to get it just right. You can pick one up here. These pais de natat are delightful and well worth the effort, just take it one step at a time and you will be just fine. They are best enjoyed with a little shot of strong coffee that they call um bica. These little espresso’s are only about 2-3 oz’s and perfect as a little pick-me-up. Did you know that half of the “New World” belonged to Portugal? Way back in 1494, the Treay of Tordesillas was signed and gave Portugal the eastern half of the New World. It included Brazil, Africa and Asia. This ended up making them the first global empire in history. They were also one of the longest lived colonial powers. It lasted for almost six centuries when Macau was just given back to China in 1999. If you would like to learn more about this amazing European country be sure to check out “Our Journey to Portugal”. Plus, there you can get more delicious and authentic Portuguese recipes. Little bites of heaven, these take a while to make but well worth the effort. 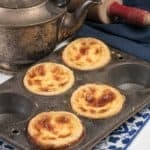 Transport yourself to Portugal in one bite! To make the dough, place the flour, salt, and water in the bowl of a stand mixer fitted with a dough hook. Mix for about 30 seconds until soft dough forms that cleans the side of the bowl. Place the dough on a generously floured work surface. Pat the dough into a 6-inch square using a pastry scraper. Sprinkle with flour, cover with plastic wrap, and let the dough rest for 15 minutes. Roll the dough into an 18-inch square. Use the scraper to lift the dough and add flour underneath to avoid the dough sticking. Brush excess flour off the top of the dough, trim any uneven edges with a pastry cutter, and using a small offset spatula dot and then spread the left two-thirds of the dough with a little less than one-third of the butter to within 1 inch of the edge. Neatly fold over the unbuttered right third of the dough using the pastry scraper to loosen it if it sticks, brush off any excess flour, then fold over the left third. Starting from the top, pat down the packet with your hand to release air bubbles, then pinch the edges closed. Brush off any excess flour. Turn the dough packet 90 degrees to the left so the fold is facing you. Lift the packet and flour the work surface. Once again roll out to an 18-inch square, then dot and spread the left two-thirds of the dough with one-third of the butter, and fold the dough as in steps 4 and 5. For the last rolling, turn the packet 90 degrees to the left and roll out the dough to an 18-by-21-inch rectangle, with the shorter side facing you. Spread the remaining butter over the entire surface. Using the spatula as an aid, lift the edge closest to you and roll the dough away from you into a tight log, brushing the excess flour from the underside as you go. Trim the ends and cut the log in half. Wrap each piece in plastic wrap and chill for 2 hours or preferably overnight. Now make the custard. In a medium bowl, whisk the flour and 1/4 cup of the milk until smooth. Set aside. Bring the sugar, cinnamon, and water to a boil in a small saucepan and cook until an instant-read thermometer registers 220°F. Do not stir. Remove the cinnamon stick then pour the sugar syrup in a thin stream into the hot milk-and-flour mixture, whisking briskly. Add the vanilla and stir for a minute until very warm but not hot. Whisk in the yolks, strain the mixture through a sieve into a bowl, cover with plastic wrap, and set aside. Heat the oven to 550°F for at least one hour. Remove the pastry from the refrigerator and roll it gently back and forth on lightly floured work surface until it’s about an inch in diameter and 15 inches long. Cut it into 1.25-inch pieces. Place the dough pieces cut-side down into each of the the 12 cups of the 12-cup muffin pan. Let the dough pieces soften several minutes until they become soft and pliable. Dip your thumbs into the water, then press straight down into the middle of the dough piece. Flatten it against the bottom of the cup to a thickness of about 1/8 inch, then smooth the dough up the sides and create a raised lip about 1/8 inch above the pan. The pastry sides should be thinner than the bottom. Fill each cup 3/4 full with the slightly warm custard. Bake the tarts until the edges of the dough are brown, about 10-12 minutes. If the tarts are not browning as much as you would like place them under a broiler for just a brief minute. Remove from the oven and allow the tarts to cool a few minutes in the pan, then transfer to a rack and cool until just warm. Repeat the steps with the remaining dough and custard mix. 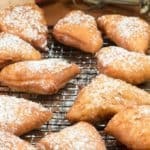 You can sprinkle the tarts generously with powdered sugar, then cinnamon before serving but it is optional. Be sure to take note of the chill time a minimum of 2 hours is required and better if you can leave it overnight. Try to remove as much flour as possible when working with the dough. The tart will get a bit tough otherwise. Make certain to preheat your oven for at least one hour before baking. 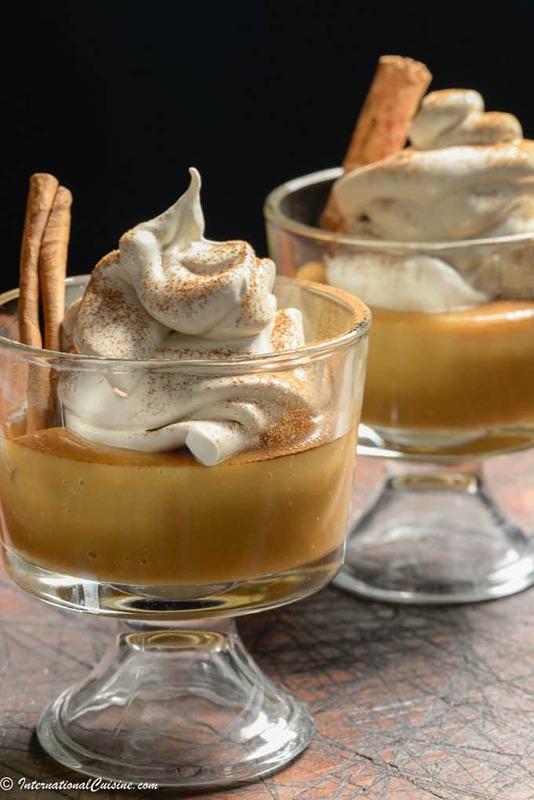 Peruvian Suspiro de Limena is a sweet caramel meringue parfait that literally means the “sigh of a Lima lady”. I think that pretty much sums up how delicious this dessert is. Made with sweetened condensed milk and evaporated milk it is an easy recipe to make. Cooking them over low heat makes the milks turn a lovely caramel color. 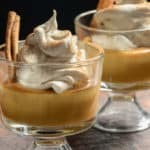 This Peruvian Suspiro de Limena recipe dates all the way back to the middle of the nineteenth century in Lima, Peru. The first known record of it was actually called Manjar Real del Peru or the Royal Delight of Peru. The dessert comes from a base of manjar blano which is the Peruvian name of the beloved dulce de leche in other parts of South America. Originally this was introduced by the Spanish as blancmange, a dish with a history dating back to the middle ages. The meringue portion was also brought to Peru by the Spaniards. It is the Peruvians who come up with these fusions of ingredients that make it world renown. This dish can be found all over Peru but is especially popular in Lima. The inventor of the dish was developed by the wife of poet Joes Galvez. Galvez gave it the name Suspiro de Limena because he said it is sweet and light, like a woman’s sigh. This dish keeps well in the refrigerator so is easy to make ahead of time for your Peruvian feast. I hope you make it and please let me know if you loved it as much as I did. After all who doesn’t love dulce de leche! Did you know that the largest flying bird on earth can be found in Peru? It is the Giant Andean Condor. Find out more about this amazing country and get more authentic Peruvian recipes be sure to check out “Our Journey to Peru“. Peruvian Suspiro de Limena literally translated means the sigh of a Lima lady. I think that pretty much sums it up! In a heavy saucepan cook the evaporated milk and the sweetened condensed milk over low heat, stirring constantly with a wooden spoon until the mixture thickens and turns a pretty caramel color, (about 30 - 40 minutes). Take off the heat. Separate the egg whites from the yolks, and use a wire beater to beat the egg yolks in a bowl. Add a couple of Tablespoons of the hot milk mix and keep beating for a few seconds. Pour everything in the saucepan and mix carefully and reserve. Peruvians call this manjar blanco. In another saucepan mix the sugar, port wine and water. Make it boil over high heat for 6 minutes without stirring. The syrup is ready when it forms a caramel thread when dropped from a spoon. Meanwhile, beat the egg whites with an electric beater at high speed until soft peaks form. For the whites to grow perfectly, they must have no trace of yolk, and the bowl must be dry and clean. Add the hot syrup in a thin and steady stream, beating vigorously until the resulting meringue is cold. 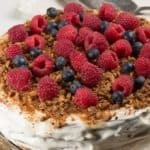 Pour the cooked milk mixture (manjar blanco) in individual cups or a larger container, cover with meringue in a decorative fashion, and dust with ground cinnamon. Serve at room temperature or cold from the refrigerator.